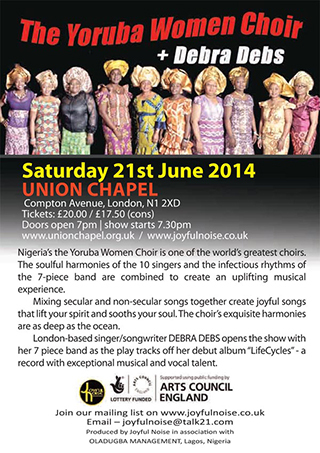 Nigeria’s the Yoruba Women Choir and London’s Debra Debs to perform at the Union Chapel On Saturday 21st June 2014. The Yoruba Women Choir with their exquisite harmonies as deep as the ocean are one of the world’s greatest choirs. The soulful harmonies of the ten singers and the infectious rhythms of the 7-piece band are combined to create an uplifting musical experience. Mixing secular and non-secular songs together expect joyful songs that will lift your spirits and sooth your soul. The Yoruba Women Choir are Funmi Olawumi (founder/leader), Ayinke Martins, Mary Tade, Dupe Lawnson, Esther Mabadeje, Joy Aigbekan, Nike Fagbuaro, Biola Dosumu, Tinu Adewoye, Biola Awolola and Kehinde Talabi. Their musicians are Niran Obasa (keyboards); Ebenezer Oke (guitar); Kayode Adeniran (bass); John Bello (drums); Wole Aina (conga); Wale Ogungbe and Imole Ayo (talking drums). London-based singer/songwriter Debra Debs opens the show with her 7 piece band and will perform tracks from her debut album, ‘Lifecycles’ – showcasing her exceptional musical and vocal talent. Earlier this year, ‘Lifecycles’ an eclectic fusion of 90s r&b, jazz, gospel and afro soul, was featured on Jazz FM’s "Album Of The Week" and has attracted interest from several soul and jazz movers and shakers.